Rural Awareness Scholar’s Award was initiated in 2007 for Franklin Township School students whose essay competition entries most effectively illustrate their understanding and appreciation of life in the Township. Topics and winners from 2007 to the present are listed below. Prizewinners all receive gift certificates to the Clinton Book Shop. First place gets $50; second, $30; and honorable mention, $10. The grand prize winner is selected from the three first place winners and additionally receives a gift certificate for a pizza night at Frank’s Italian Restaurant in Clinton. The Clinton Book Shop and Frank’s Italian Restaurant generously partner with Rural Awareness each year for the competition. All entrants receive a certificate of participation. For 2014 and beyond, click on the child’s name to view the essay. 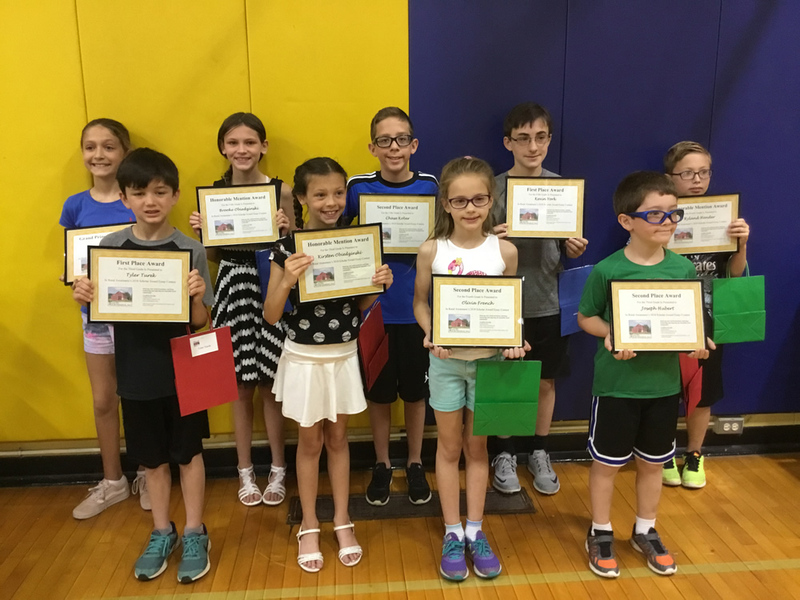 Rural Awareness Scholars for 2018 at Franklin Township School are, left to right: Sophia Randall, fourth grade first place and Grand Champion; Tyler Turek, third grade first place; Brooke Obiedzinski, fifth grade honorable mention; Kirsten Obiedzinski, third grade honorable mention; Chase Kober, fifth grade second place; Olivia French, fourth grade second place; Kevin York, fifth grade first place; Joseph Hubert, third grade second place; and Ryland Hender, fourth grade honorable mention. Third grade: Tyler Turek, first place; Joseph Hubert, second place; Kirsten Obiedzinski, honorable mention. Fourth grade: Sophia Randall, first place; Olivia French, second place; Ryland Hender, honorable mention. 2017: What do you need to do to be a good, contributing member of your community, whether in your school or in your township? Fourth grade: Brooke Obiedzinski, first place; Tarek Jafri, second; Scott Turek, honorable mention. Fifth grade: Madilyn Thompson, first place; Olivia Luciano, second; William Peck, honorable mention. 2016: We’re fortunate to live in a rural area with open space and miles of beautiful trails and country roads for walking, hiking, horseback riding, bicycling, and picnicking. Tell us about what you see and hear – and especially what you feel – when you’re outside enjoying nature here in Franklin Township. Fourth grade: Madilyn Thompson, first place; Alexis Lonoff, second; Katie Piotrowski, honorable mention. Fifth grade: Kaitlyn Meyer, first place; Taylor Simms, second; Alexander Turner, honorable mention. 2015: Write a letter to future Franklin Township School students about the school today. Rural Awareness wants your help in creating a time capsule that will be opened in 2037 – – 22 years from now – – in celebration of the 1837 little red schoolhouse’s 200th anniversary. We’re asking you to write a letter to Franklin Township School students of 2037 telling them what is special about the school in 2015 and what you think might change at the school over the next 22 years, even if you wish it would stay just the way it is today. Third grade: Olivia Luciano, first place; Danielle DiEsso, second; Thomas Jack ‘TJ’ Mani, honorable mention. Fourth grade: Kaitlyn Meyer, first place; Bradley Kneller, second; Liah Forbes, honorable mention. Fifth grade: Elias Thompson, first place; Lauren Salemo, second; Christina Piparo, honorable mention. 2014: There are several fun events in Franklin Township during the year, like Community Day, the fishing derby, trunk-or-treat, summer recreation camp, and others. Imagine that you are telling a student your age who has just moved to Franklin which event you like best and why you like it. Or maybe your favorite event is one your family or neighborhood holds here in Franklin Township; if so, tell the newcomer about it. Third grade: Samantha Muller, first place; Taylor Simms, second; Liam Wilde, honorable mention. Fourth grade: Elias Thompson, first place; Ryan James Drwal, second; Kyle Johnson, honorable mention. Fifth grade: Gabrielle Meyer, first place; Sean Hyland, second; Anthony Riello, honorable mention. 2013: Imagine you’re a newspaper reporter. Interview someone who graduated from Franklin Township School before 1995 and write a newspaper article that tells the person’s favorite memories and stories of life at FTS. Third grade: Elias Thompson, first place; Lauren Salemo, second; and Dominick Edwards, honorable mention. Fourth grade: Kyle Schultz, first place; Kelly Sautner, second; and Matthew Lilien, honorable mention. Fifth grade: Jake Ehrmann first place; Renee Soika, second; and Claudia Kreitler, honorable mention. 2012: What makes the rural community of Franklin Township such a special place to live? Third grade: Aaron Fisher, first place; Tiago Costa, second; and Gabrielle Meyer, honorable mention. Fourth grade: John Erik Drwal, first place; Logan DeCanio, second; and Christina Faust, honorable mention. Fifth grade: Thomas Obiedzinski, first place; Jane Lundgren, second; and Brittany Marcantuono, honorable mention. 2011: Tell us why we need farms in our rural community, using your favorite farm in Franklin Township as an example. Third grade: Gabrielle Lamer, first place; and Alice Lundgren, second. Fourth grade: Brittany Marcantuono, first place; and Adam Coe, second. Fifth grade: Cole Salemo, first place; and Sky Gonzalez, second. 2010: If you could create laws to protect the rural quality of Franklin Township, what would they be? Third grade: Jack Gilmore, first place; Brittany Marcantuono, second; and Grace Gordon, honorable mention. Fourth grade: Erin Carbone, first place; Gillian Wintermute, second; and Kyle Conover, honorable mention. Fifth grade: Tyler Marcantuono, first place; Quinn Cleverley, second; and Morgan Innella, honorable mention. Third grade: Rachel Schultz, first place; and Hallie Mathews, second. Fourth grade: Brendan Flanigan, first place; and Tyler Marcantuono, second. Fifth grade: Jessen Haug, first place; and Courtney Schwar, second. Sixth grade: Anna Piparo, participation award. 2008: Tell us about your favorite farm in Franklin Township, and tell us why farming is so important to our rural community. Third grade: Haley Wright, first place; and Tyler Marcantuono, second. Fourth grade: Jessen Haug, first place; and Cameron Crisologo, second. Fifth grade: Alyssa Mancini, first place; and Phyllis Pan, second. Sixth grade: Hugh Zimmerbaum, first place; and Spencer Parker-Klimpel, second. 2007: What makes this rural community of Franklin Township so special to live in, with its beautiful farmlands, fields, forest, and historic places? Third grade: Carmine Ricciardi, first place; and Tabbatha Schultz, second. Fourth grade: Bianca Riello, first place; and Ian Fallon, second. Fifth grade: Hugh Zimmerbaum, first place; and Bruce Cargill, second. Sixth grade: Kaity Edelmann, first place; and Jake Popa, second.